I am all about Speed Champions, the new line of racing themed Lego sets that will be released in 2015. I will be purchasing every single one of the sets in multiple, but the thing is...they aren't very good. In the who wore it better of Lego builds, I think Hoexbroe takes the win. I understand that keeping the cars in minifigure scale and making them look great is a hard thing. They are also being built to a price, but I want Lego to realize that the market for these, like every licensed racing line you have done in the past, is kids and adults. The various Ferrari sets that Lego has put out over the years adorn the shelves of race fans everywhere. We love cars and we love Lego. You are making this stuff to be played with, but it is more likely to be displayed. They are like Hot Wheels, or more accurately, Auto Art, just made of brick. This diorama was shared at the annual HispaLUG Expo in Barcelona, Spain to the delight of many Lego fans. The build is just wonderful and shows some fantastic detail of what it is like attending a race weekend. The fans, though there should really be flags and air horns. The huge portable screens displaying the action. A huge shunt into the barrier. Helicopter footage of the accident scene. You didn't know Maldonado went to LegoMans. Lego is certainly not going to release a kit that has this much detail and caliber in one go, but the racing theme could absolutely be expanded on this way. They should make modular pieces of a race track just like they do with with the Modular Buildings line. 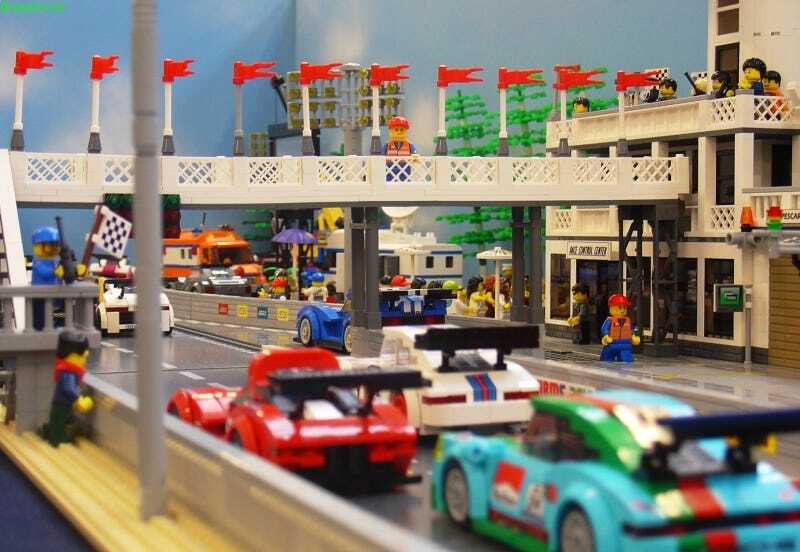 I am excited that Lego is getting back to making racing themed kits, I just wish they were even a fraction as good as this display.